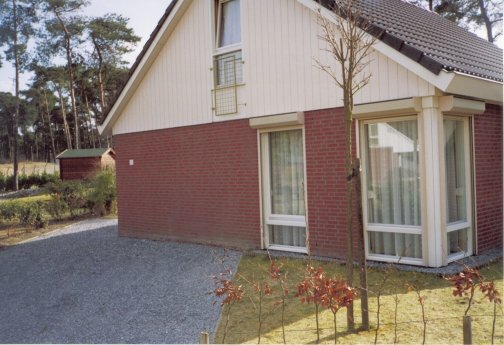 In november 2002 I bought a house on a holiday park "De Zwarte Bergen". It has a area of 400m2 and a piece of 150m2 which is under loan. 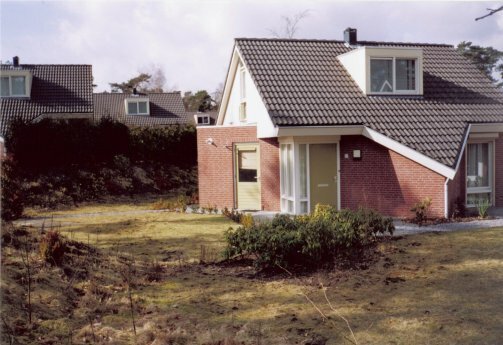 The house takes about 70m2 of it. The rest is garden/terras and car park. 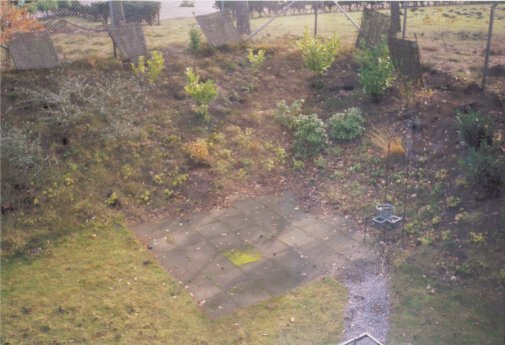 Below are some pictures from how the garden looked like when I bought the house. 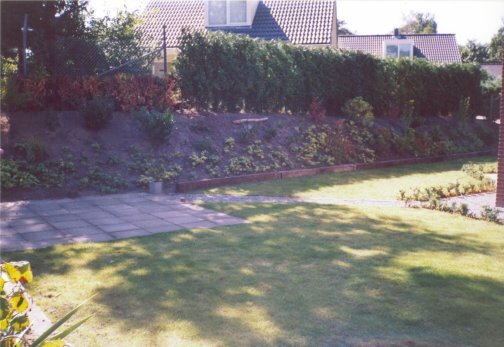 The garden was build by a professional gardner but never maintained. Every where grass and weeds were growing. So the plants didn't have a chance to grow. Quite some rabbits were entering the garden, so holes every where. The plants which were put in the garden were not liked rabbits for food. First thing me, my mum and dad did is remove the grass and weeds. Beginning of 2003 railroad wood was placed to take care that soil of the slopes didn't go into the grass. Next the little stone terras had to make place for a fishpond. The fishpond could be made nicer if I had put wood around the edges so the plastic foil would not be seen so much. 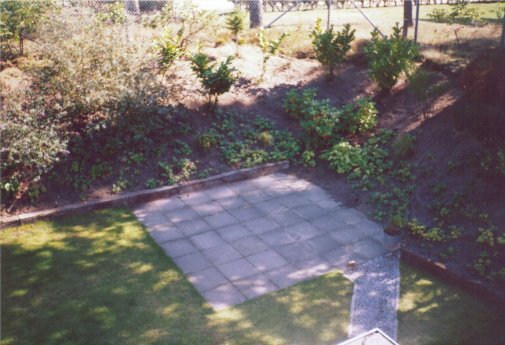 End of 2003 the garden was surrounded by gauze 1.2 m high and smaller gauze at the bottom, to keep smaller rabbits out. Also the dogs can walk freely in the garden now. The carpark is enlarged with 1.5m, now 2 cars can be well parked, an other can be parked in front of the other 2. 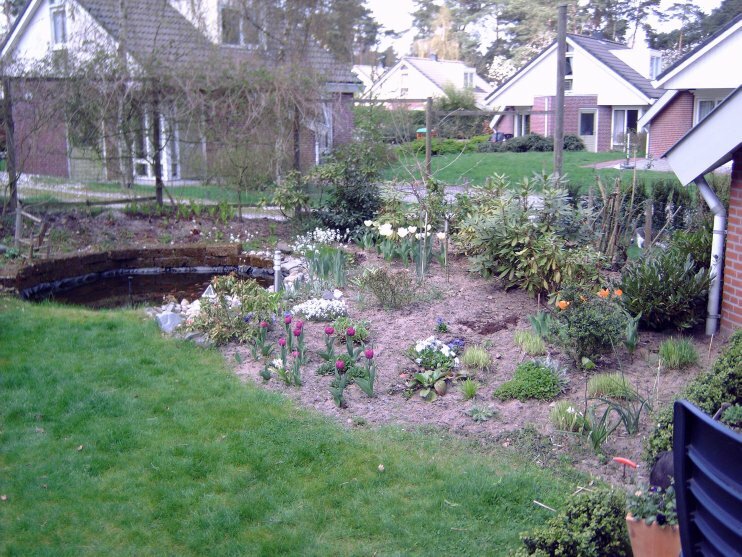 Below is a picture of the fishpond in february 2004. More water was wanted in the garden, so a wine barrel was bought with a pump. To get more storage space for bicycles and motor bike a contruction caravan was bought. 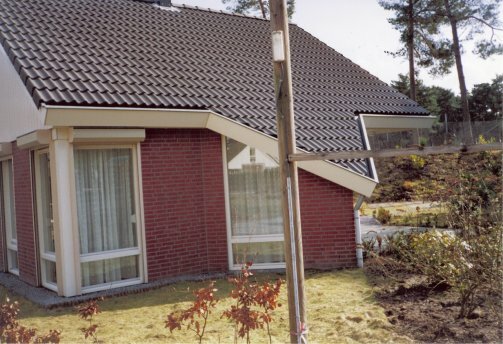 It's in the same colours as the house. Electricity and light have been made in it. Also a slope is made to get bikes and motor bike easily inside it. The front and back side are reconstructed, the woord, was not so good anymore. 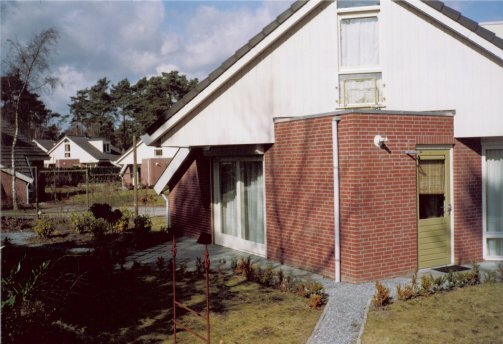 Also two windows were made to the garden, on the neighbour side a window were already there. 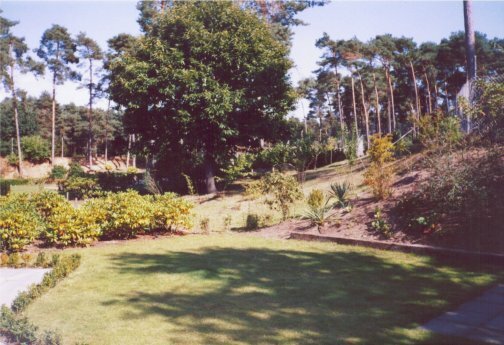 The garden in july 2006 can be seen below. The plants and flowers are fully grown, the grass is becoming yellow because of the heat. Giving more water could have stopped it. 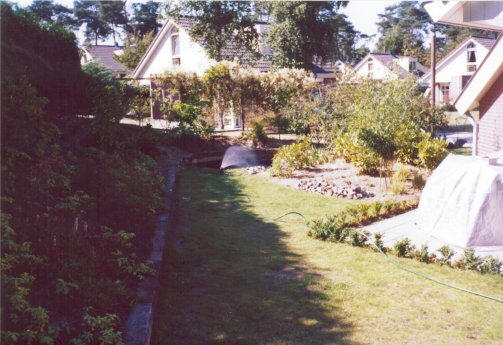 Future plans are a a real outside pool, bigger fishpond and a wooden rain cover (now it made of fabric and iron).